If you are based in New Zealand and signed up to Physitrack through Gensolve, it could be that the Physitrack account that was created for you contains an email address that is different from your own email. This is because on Physitrack, every practitioner is required to have a unique email address. On Gensolve, this is not the case. For example, if your email address is practitioner@example.com, it could be that the email address that we created for you would be practitioner+123456789@example.com (where the number is a random number). 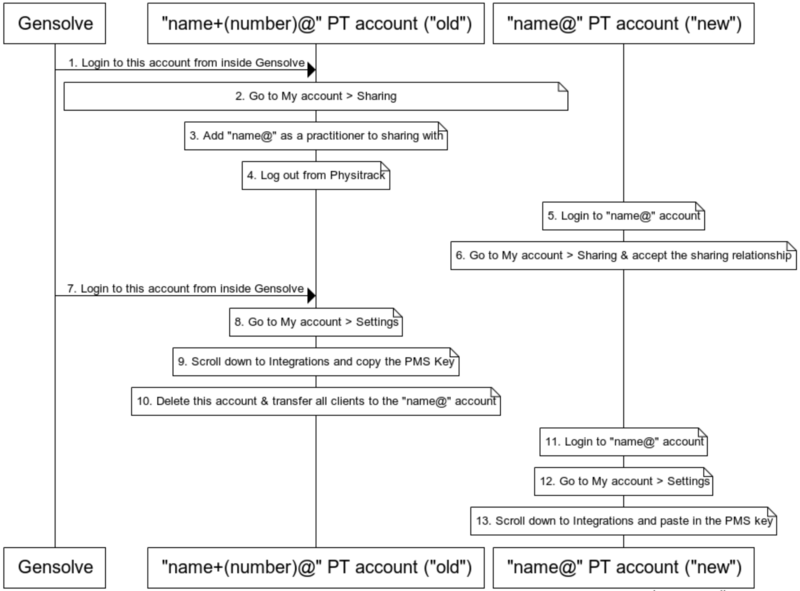 This happened in cases where an account practitioner@example.com already existed on Physitrack, or where multiple Gensolve users that didn't each have a unique email address inside Gensolve, connected to Physitrack. To transfer the clients from the old account to the new account, please follow the steps shown below. Note: before completing these steps, please make sure that your new account has a valid Physitrack subscription. This can be either by subscribing directly to Physitrack from within this account, or by including the account in a PT Direct subscription of your practice. Login to Physitrack with your new, "name@" account. Go to My account > Sharing and accept the sharing relationship.